A Potain MCR 160 crane ... saves space and costs. Abu Dhabi-based NFT, a leading global supplier of tower cranes and Potain’s Number One business partner, continues to grow both regionally and globally, setting up bases all over the Middle East and partner offices in the UK and Belgium through Radius and NFT Europe. The company – which pioneered the supply of tower cranes in the Gulf region – has been ranked as the foremost tower crane worldwide supplier and rental company in terms of capacity for two consecutive years (IC tower index, 2016). To date, it has supplied tower cranes to 32 countries and is able to export to anywhere in the world. What sets NFT apart from the rest is its remarkable stock of 2,000 new and used tower cranes, more than 500 hoists, and full stock of quality spare parts, enabling it to supply crane models ranging from the small self-erecting cranes – 700 kg and 26 m-per-minute capacity – up to the enormous MD 3200 with a lifting capacity of 80 tonnes, according to a company spokesman. NFT’s growth ambition has led it to invest in a 300,000-sq-m yard with a special facility to recondition used cranes to almost brand new. It now has three main yards and 20 depots in the GCC. “The facility is a state-of-the-art assembly line that follows step-by-step improvements from testing to electrical work and welding, shot-blasting right up to painting, all in accordance with European standards,” says the spokesman, adding that NFT is aware that used cranes have a higher market share than brand new, in terms of volume. NFT also continuously supplements its stock with new products and services, ensuring it is able to supply the latest and most innovative lifting technologies. 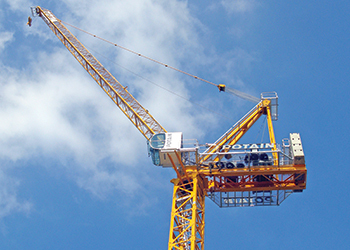 The company orders an average of 150 to 200 brand new tower cranes a year to update its fleet, including the CCS range launched by Potain in 2016. Indeed, NFT currently has a dozen CCS models available, and this number is set to increase as demand goes up. Having been in the industry since the 1980s has allowed NFT to develop technical expertise to cater to the region. Its expert engineers can study projects and recommend the most efficient, cost-saving and optimised solutions. Due to a rise in high-rise construction in congested areas, Potain’s luffing tower cranes have become very popular over the past three years. Luffing cranes are special as they can manoeuvre in tight spaces, when surrounded by buildings. 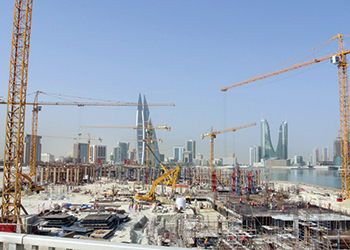 The King Faisal Corniche Development ... NFT’s cranes deployed on site. However, the most popular model for NFT is the MC310 K12, which has a 70-m jib, lifting three tonnes at the tip and 12 tonnes maximum. In Bahrain, NFT has erected a handful for the King Faisal Corniche Development. “The GCC is quite unique when it comes to special requirements for high capacity cranes – 30 to 60 tonnes; the region has the highest population of such cranes. Recently, NFT erected four MD 1100s for a car-park project in Kuwait,” says the spokesman. “The MD 1100 cranes are an increasingly popular option on large infrastructure projects that require the handling of large structural components. They have a maximum capacity of 50 tonnes, while at their maximum jib length of 80 m they can lift 10.6 tonnes,” he adds. He says the demand for high-capacity tower cranes is pushing manufacturers to focus on bigger equipment and NFT’s advantage is that it has the largest tower cranes by Potain in its fleet, such as strong luffers with the MR 418 and MR 608. In this category, NFT has partnered up with GJJ to create the exclusive Orbit brand. For the less price-sensitive clientele, NFT is also the exclusive dealer for Pega, a CE-certified European brand of hoists that have a load capacity ranging from one to four tonnes and a speed between 36 and 120 m per minute. A fleet of 16 Pega hoists were used on the Burj Khalifa in Dubai going up to a height of 801 m, including the world’s fastest Pega hoist – 120 m per minute with a significant 3.2-tonne lifting capacity. Commenting on the challenges in the industry, the spokesman says European brands are being compared to Chinese brands. Potain is a French brand, and although it has an Asia range that allows the brand to be more competitive, the structure, quality control, design and ergonomics remain fundamentally French, the spokesman emphasises. “That’s why the dealer has a campaign running this year, entitled ‘French Engineering’ to show that the skeleton of every Potain tower crane is French and that has not changed since its inception in 1928,” he adds. Most recently in the GCC, NFT has supplied tower cranes to projects such as the Royal Atlantis Palm Jumeirah, Expo 2020 projects, Riyadh Metro, Kuwait’s new international airport by Limak, as well as Bahrain’s King Faisal Corniche Development and the Omantel headquarters by Al Tasneem.